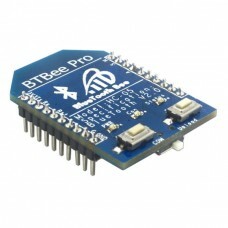 The BTBee Pro Bluetooth Wireless Module is a XBee compatible serial module. The BTBee Pro provides Bluetooth serial data transfer with support for both master and slave transmission modes. It can be plugged into the XBee socket provided by compatible Arduino Shields, microcontrollers and other modules to gain wireless Bluetooth capabilities. The BTBee Pro module can operate in transparent serial data mode or in AT command mode and supports programming over Bluetooth.